Last May, I bought a ram's fleece at MD Sheep and Wool. The fleece's name is Stinky. Stinky has been sitting in his plastic bag in a closet since then, with a few locks pulled off and spun in the stinky grease to see what it was like. Then I found out what makes rams smell particularly bad (it's urine) aaaand quickly decided no more of that. I finally got around to scouring a bit of Stinky. I haven't done this before, ever, so it was an experiment. I pulled off two 8" or so long hanks of fleece and laid them side by side in a lingerie bag. I wasn't sure how full I could fill the bag before water wouldn't be able to circulate easily, so I erred on the side of "less full." I should have weighed the fleece but I didn't. I used a styrofoam cooler that the bag fit nicely in. I put it in the shower and added the hottest tap water until there was enough to submerge the bag. Some websites said to use soap by weight of fleece; Eucalan (the soap I was using) said to go by volume of water. I guesstimated that I had a gallon or so, but used double the amount called for (2 tsp) on account of Stinky being so stinky. I added the soap and gently stirred to dissolve without raising bubbles. I sank the fleece into the hot water. A few bubbles were raised but not too many. I put the lid on the cooler and waited 15 min. I lifted the bag out of the water and laid it on the upturned cooler lid, then emptied the cooler. There was still noticeable smell, so I did it again. There was still some smell after three washings, but it's wool, so there's gonna be some smell. I decided to let it dry and see how it had turned out. I folded an old towel around the bag to press out water, then let the wool and bag air-dry. Two days later, I had an opportunity to look in on it. It didn't felt! There was still some odor, but I compared it to a whiff of Stinky still in the bag - it was much, much reduced. Working with the fleece, it was not noticeable. Only when I stuck my nose in it. Next - trial of combing techniques. Last time I tried my combs, I jammed locks down onto the teeth and started from there. I was told (can't recall by whom?) to instead lightly drag the locks against the teeth, letting them catch bit by bit. I did this, and then pulled off the tog. Unfortunately, the "lightly dragging" process had jumbled the lock structure, and I only got most of the tog. Stinky has distinctive black-red-blonde tog and grey thel, so it was really obvious there were a good number of tog strands still in there. I combed the thel/tog blend anyway, to get some practice combing. I seem to leave a lot of waste on the combs - I was picking it up and trying to re-drag it onto the teeth so I could pull a bit more off. Not sure if this is good or bad? First batch of combed wool. You can see the red streaks of tog all the way to the base of the locks. Also, combing in low humidity is, um, fun. Especially the long, hairy tog, that just wants to fan out like a kid rubbing a balloon on her hair. Next, I separated individual locks, grasped them firmly, and pulled out the tog. This got much more of the tog out - the thel looked entirely grey. It did take longer. I also tried jamming some locks down onto the combs, pulling the tog, and then removing the locks to drag them more nicely on the combs. This jumbled some of the fibers and doesn't seem to be the best idea. I combed the tog and the thel, and saved my waste. Then I combed the waste! In the end, I got three slivers (not counting the first one where I left a lot of tog in) and much less waste. All three had clear tips and roots. The thel still had some short, dark tog in it, which migrated out to the tip of the sliver, but it was mostly light gray. The tog looked like an enormous strand of Stinky's hair, very dark at the root, turning red, and then blond at the tip. The waste, which was a mix of the thel waste and tog waste, was darker on account of the tog, especially towards the tip. I would expect the fibers are not as well aligned in this one, and it'll be interesting to see if I can feel a difference in how they spin up. I needed winningas in a lichen purple shade. At Pennsic, I found light grey/dark grey herringbone twill leg wraps at Boots by Bohemond. A fellow customer strongly encouraged me to look into the silk dyes at Dharma Trading Company. That made sense, since silk and wool are both protein fibers. Once home, the Dharma dyes and kits seemed a bit intimidating, and various people on the Internet seemed to have reasonable results with Rit dye. I decided to try that. Especially since I wanted a light color, it seemed like that might work okay. I remembered to weigh the dry wool. At half a pound, I probably only needed 1/4 of the bottle of dye, but I used 1/2 so I could use more water and also to ensure some sort of color. I purchased Orvus Paste to scour the wool. Two tablespoons in about 3 gallons of water hot from the tap. I gently pressed the wool into the water and let sit for an hour, then drained off the soapy water. I checked the water temperature by feel, did my best to match it from the tap, and let the wool soak for fifteen minutes or so in a rinse. (Sudden temperature shock will felt wet wool.) Checked temperature and drained again. I added water of about the same temperature to the pot, plus the dye, plus about a cup of white vinegar (said to help set the dye on wool). I added the wet wool and placed the whole shebang on the stove set to low. I wasn't sure what to do next. Most of the websites talked about constantly stirring the pot. But you generally don't want to agitate wet wool - it felts. I hesitantly stirred, very slowly, and mostly rotating the entire mass of wool rather than rearranging it. The color seemed very dark very quickly, but I also found that if I held the wool up, the dye-water would drain out of it, leaving a lighter color behind. Worried about felting and seeing a fairly medium purple (and knowing that colors look darker when wet), I pulled the pot off the stove after only about 5-10 min or so. I rinsed in clear water (still trying to match temperature) until it ran mostly clear - I'd done five or six rinses and I was still getting some dye, and I decided to call it good. Husband has been warned that there might be some dye transfer if he gets these wet. I hung them out on the porch to dry. Overall: Okay! Mostly even color, with one or two spots that are more pink than the surrounding, but it's subtle. It came out a medium lavenderish, which might be too dark for lichen purple, but I'm okay with it. The wool is maybe slightly fuzzier than when it went it, but it's not a long piece of felt, so I think that's okay too. Mammen stitch, with just one linking stitch picked up instead of two. Blue yarn is commercial Merino (I think; I have the card for it around somewhere). I remember the card said it was hand dyed, and it may be handspun as well. From South America. Could maybe have been another row longer. I used my thumb for a gauge. Lighter colored yarns are so much easier to work with. There are a double handful of mistakes in the brown, I think because it was so hard to see which loops I was picking up. With the blue, everything was very easy to see. These singles were also much nicer to work with than the plied yarn I tried. No tails to weave in, since you can spin the yarns together. Photo is somewhat washed out (tried to adjust for too-dark background). The brown is a deep chocolate brown. The blue isn't much darker than shown, though. This will probably become a normal hat come winter time. It's nice to have an SCA-appropriate warm hat, but honestly I find few occasions to wear cloaks, mittens, etc. In the outdoor season, it's usually too warm, and for the indoor season, I'm indoors. Well, if I ever make Tournament of Ymir, I'll be all set. Per the last post, I have turned 50 yards of handspun dark brown wool into most of a hat. It is not quite enough. I think 75 yards would have done it; 100 yards would have done it easily. I will make up the rest with the light blue yarn I have left from the socks. I think that was also sold as handspun, but by a person in South America, not by me. Not knowing anything about knit (or nalbound) hats, I made a flat disc with the intention of tapering the sides out into a bowl-shape. Well, I let the disc get too big, so the taper became a right-angle turn. It's looking like a pillbox hat. I think when it's long enough to pull snugly onto my head, it won't matter too much - the odd bumps should smooth out. Wetting and blocking it (I have to find out how to do that) may also help me reshape it into more of a sock-hat. I did this much of the hat over the weekend. It went relatively quickly. I have no good reason to be working on a wool hat right now, when we're in the middle of a July heatwave. It just seemed rather urgent that I get the hat made. Or, Sometimes When You Ignore Common Sense, You Create Art; and Sometimes, You Create a Mess. Sing I the praises of Meisterin Johanna von Sudeborn, generous hall-leader, who in time of cold and darkness did gift this humble poet of her homestead with wool yarn in bold colors. Such are her wisdom and insight that the wool was colored purple and green, the colors of my lord husband and his Eastern household. And so, to do honor to this gift and to my husband, I undertook to create for him some warm thing to wear. I started with an attempt to nalbind a hat. (Okay, I started by winding the yarn into balls using a 1" dowel as a nostepinne.) I discovered that the yarn was rather curly and bouncy, and the nalbinding was frustrating. Maybe, I thought, I could weave a scarf. Why, you may ask yourself, did I think it was a good idea to take curly and bouncy yarn and try to weave with it? I have no good answer. I recognized that this was likely to be a liability, yet there I was, putting a green yarn warp onto my tapestry loom. 90 warp ends for a 10" wide scarf. Maybe, I thought, I could do a twill. So, with 'Honest Movie Trailers' playing in the background, I tied around 150 string heddles for a 4-shed plain 2/2 twill. (I had about 30 already tied.) And then I put those 180 heddles onto my 4 heddle bars and my 90 warp ends. And I wisely put the project down at that point (warping and heddles took about 5 hours), and went to bed. The next day, I sat down and raised the first heddle bar. The 4 heddle bars occupy something like 6" of length on the loom. When the top one is lifted (and you have springy, lively warps), the shed is fairly well vanished by the time you try to get your shuttle through under the bottom one. I tried to soldier on, thrusting my weaving sword approximately where the shed might have been, and tried to weave in a few waste rows, but... it became increasingly evident that this was Not Happening. As I might have expected, given the nature of the yarn. I have not yet written the project off! I have retired two of the heddles, leaving me with what I think is called a half basket weave - one weft goes over two, under two, over two, under two. With only two heddles, the top shed is much closer to where I can put the shuttle through. I wove some waste, and a few rows of purple yarn, and called it done for the day. If all goes well, when I take it off the loom, it will... probably do something crazy and crinkly, and maybe I will learn to block a wool garment. 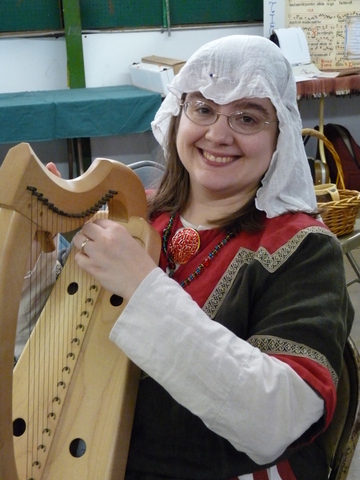 I've tried the music on early harp, wire harp, and lyre. Not sure which I want to use for accompaniment yet. Also not sure if I want to have the accompaniment be the melody or some moving open fifths. Time and practice will help me figure out what's doable and what's not. I do eventually hit a wall where I can't concentrate on all the moving parts. And I'd rather focus on the vocal performance and simplify the accompaniment than the other way around. I can always do an instrumental intro and/or postlude to show off the instrument. (Context) Finally got around to reworking this. Managed to make it too short. Sigh. I have been really careful with pinning, ironing, and finishing. Somehow the pins that marked the right length the last time have resulted in a cap that hangs barely below my chin. Eh, whatever. It's still pretty cute. I need to make tying strings, and I'm trying to figure out how I should do that. My linen coif has 4-strand braided linen ties, made using a fairly coarse linen thread (1.5mm dia?). I have some nice blue linen thread, but it's much finer. I could spin it to cord, or try whipcording it... or I could use the (undyed) thicker linen thread I have in a braid or whipcord, or... I'm going to just play around with some things. I'm also thinking the edge by the face needs a decoration, either a matching blue silk braided band like the bottom edge has, or else those teeny Viking embroidery circles from Oseberg. (Context) Found my stuff! Hiding under fabric stash, naturally. I don't know/don't think the hand spindle I bought is actually an Oseberg repro, now that I look at it. It definitely does not function as a ball winder. It's got a knob at the end of it (like some other things) and the wound ball can't pass over it. My darling husband got me three spindles from Hershey Fiber Arts for Christmas, and they are lovely. I've used the low whorl one as both a low whorl and a high whorl, and I've also tried the spiral-grooved one. Using low whorl as low whorl: This worked really rather well. I tried a combination of park-n-draft (modified for the way I'm trying to spin) and a more continuous motion when I spun the spindle in one hand, pulling it right as I drafted off the distaff with my left. But I wasn't using the tiny ledge cut into the spindle to secure a half-hitch, and I thought it might be abrading the yarn. Using a low whorl as a high whorl: So I turned it upside down, because the tip in low whorl configuration was totally smooth. I think that helped, but I found the high whorl set up much harder to grasp. I had to do a supported spinning sort of park-and-draft, where I spun the thing on my leg until I had a good amount of twist, then drafted out. When I tried the grasped spinning, I tended to drop it a lot. I should also try her high whorl spindle, although I suspect the only difference between the two is which end the little notch goes on. Grooved spindle: Just started this one today. It's low whorl. It also works very well. Jury is still out on whether or not the groove is fuzzing up the yarn. The yarn is already pretty fuzzy. I think learning to spin worsted in definitely on my to do list. At Pennsic 45, I bought an Oseberg hand distaff. I'll add a picture later, but you can Google it and see lots. Lois Swales shows the use of one in her Spin Like a Viking video. Trouble is, "hand distaff" doesn't make a whole lot of sense if you're doing grasped spinning. Part of the point of a distaff is that it serves as a third hand, holding the fibers while the off-hand drafts and the primary hand spins the spindle. Since I'm trying something different from the South American-style drop spinning (which could benefit from a hand distaff, at least as a way to carry and organize fibers? ), I'm left looking at my hand distaff and wondering what I'll use it for now. Sven the Merchant in Lochac may have my answer! He sells Oseberg hand distaffs - but he sells them as nostepinnes, or ball-winders. Now, this isn't entirely a sure identification either, I think - the surviving items look like they have narrowed ends and a swollen belly, which might make getting a wound ball off the stick difficult. (One end could be narrower than the belly.) On the other hand, YouTube instructional videos on nostepinne use are telling me not to wind on the yarn too tightly, lest it be stored in tension and then relax and shrink upon first washing. The belly on the distaffs/nostepinnes is rather small, and if the yarn was wound on with some give, it might not be hard to slide off at all. I still have the spun Romney wool that Lady Sabine gave me in September on my niddy-noddy. Maybe today I'll soak it and stretch it to (finally) set the twist, and once it's dried, try winding it onto the Oseberg thingie to see how it goes. Update: The hand distaff/nostepinne has gone into hiding, along with the clay whorls and chopsticks I got at BOTB. They all last came out to play for the September SENEA meeting, so I suspect they are all hiding together. Somewhere. I have checked the usual places and a few unusual ones. Nothing so far. But I didn't want to leave the skein hanging around. Never mind that it's been sitting happily on a niddy-noddy since late September. I did take it off yesterday (after doing 4 figure 8 ties), soaked it in warm water (10 min), snapped it (hands inside the skein, pull out sharply), and hung it (weighted with two wrenches) to dry. It was dry today and it just had to be balled. Recalling my last adventure in yarn balling, I looped the skein over two chair backs and moved them apart until it was held up by tension. I used a 1/4" dowel as a nostepinne. Worked pretty well! It's supposed to be a center pull ball, but I lost the center string. (That's where having a real nostepinne with a knobby bit to wrap the free end around would have been helpful.) No big, I can pull it from the outside. I see now why yarn swifts are a thing. Unlooping the yarn from the chair backs was a little tedious. I have a ball of yarn! It looks really good, like real yarn! Now... what to do with it?